Drop batter by tablespoonfuls onto prepared baking sheets and bake at 375°F for 12 minutes or until golden. Cool baking sheets on wire racks for 5 minutes. Transfer cookies to wire rack to cool completely. Sit back with a cuppa and tuck in! 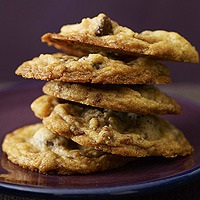 This entry was posted in Biscuit Recipes and tagged biscuits, chocolate, cookies, toffee. Bookmark the permalink. Greetings! Looks it is very tasty I love all new it is necessary to prepare for houses. It looks like so tasty. I want to try it as soon as possible.